What could be better than eloping with your loved one to the towering forests and quiet meadows of Sequoia National Park?From the park’s namesake trees stretching into the sky, to the mountainous peaks and raging rivers, Sequoia National Park is a wonder to behold. These ancient forests have withstood storms, drought, and fire for thousands of years and still stand defiantly tall. One foot into the park and It’s easy to see why folks like John Muir were so enamored by these quiet giants. Truly a beautiful location to vow yourselves to one another forever. So whether you’re eloping to sequoia, or having a traditional wedding there, let’s venture into the forest of giants together. 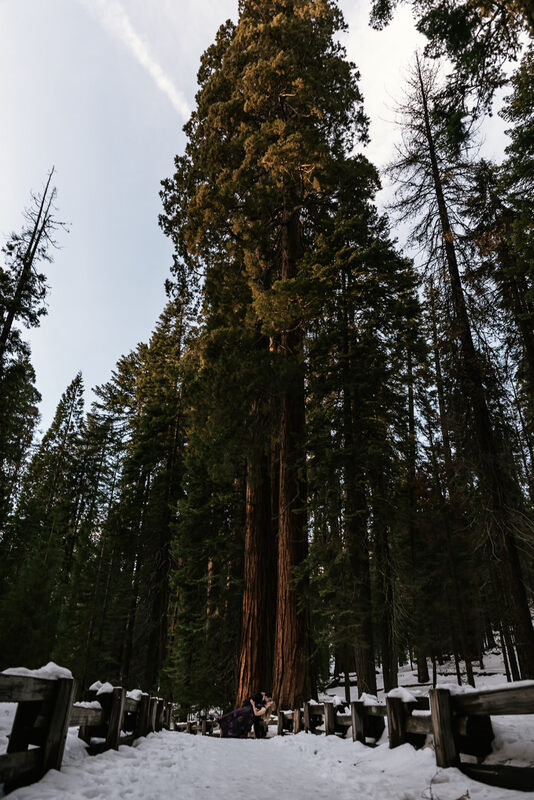 I’ll never grow tired of seeing Giant Sequoia, so I've gone ahead and taken 10% off wedding and elopement packages in Sequoia National Park. Look below and you’ll find a perfect photography package for your wedding, no matter how grand, or intimate it might be. Together we will create something amazing! Sequoia is an ideal elopement destination for those who have always dreamed of tying the knot in quiet forest. From sunrise till sunset, we can explore the park taking in sights, and creating beautiful portraits you and your love will treasure for a lifetime. I place no limits on the number of images delivered, and every photo is lovingly edited to look their very best. All delivered to you on a USB drive. Print your images at your favorite photolab and share them to your heart's content. A short montage of your romantic adventure through the national park. You will receive a link to a private web gallery that is password protected, perfect for sharing with friends and family. From here you and your family are able to view all of your photos, and order prints from my favorite professional print lab. Tying the knot in or near Sequoia? For intimate weddings without a lot of events my simplicity package is a perfect fit with six hours of coverage. From your ceremony to the reception we’ll create timeless photos you can treasure for a lifetime. We can even explore a bit and create unforgettables photos with the parks beautiful landscape. WIth a second shooter and all day coverage you can be sure that every moment of your incredible wedding day in Sequoia will be captured from multiple angles and perspectives. Since we have the whole day we’ll have plenty of time to capture both the events of your wedding, and our exploration of the park. A sequoia wedding is a special event, one that deserves to not only be photographed but turned into heirlooms that you can past down from generation to generation. With a handmade leather bound photo album and archival canvas prints, this package has everything you need to do just that. Your wedding or elopement is an incredibly special moment in your lives and I want you to have the best experience possible. To that end I’m more than happy to assist you in your planning endeavor. From providing recommendations on locations, and scheduling to the little things like helping you carry decorations to the ceremony. Whatever I can do to help make your day go smoothly I’ll do. And while we’re at it, let’s have some fun too! Beyond being a photographer, I’m a backpacker, hiking enthusiast, and lover of the Sierra Nevadas. I’ve trekked the trails, wondered at the sights, and ventured down the backroads of Sequoia and beyond and know where we can find the perfect spots to be the backdrop of your Sequoia Elopement. From iconic locations like The Giants Forest, to the hid away mountainous region of Mineral King, I’ll help you find the best spot for your romantic adventure. Love the idea of a Sequoia Wedding? Well so do I! Send me a message and we’ll plan you a grand adventure through this iconic National Park. So whether you are eloping or went with a traditional wedding, Let’s be adventurous!